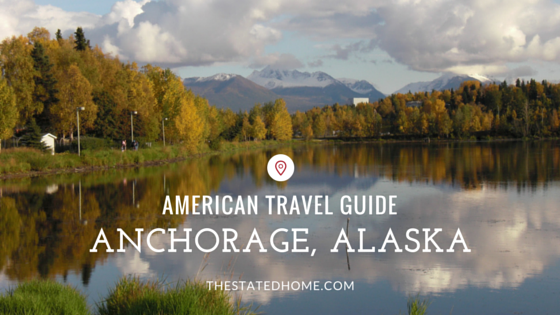 One of our co-founders, Laura, had the pleasure of calling Anchorage home for about two years. She got to eat some of the freshest fish she’s ever had, try cross-country skiing, and have a baby moose in her front yard. It may seem like the only people who would enjoy going to Alaska are those who like to fish or those who like to cruise, but it’s actually an awesome destination for anyone who enjoys good food, clean air, and chance encounters with wildlife. This shop has a wide selection of Alaskan-made products and books about the state. Though some of the offerings are a bit kitschy, we love their ceramics, jewelry, soaps, and food items. We suggest picking up some Ravens Brew coffee and a mug to drink it from. This store sells mostly cool t-shirts and sweatshirts from artist Shara Dorris. The subject matter is sea-life inspired – she does a creative interpretation of things like fish, birds, and even octopus. 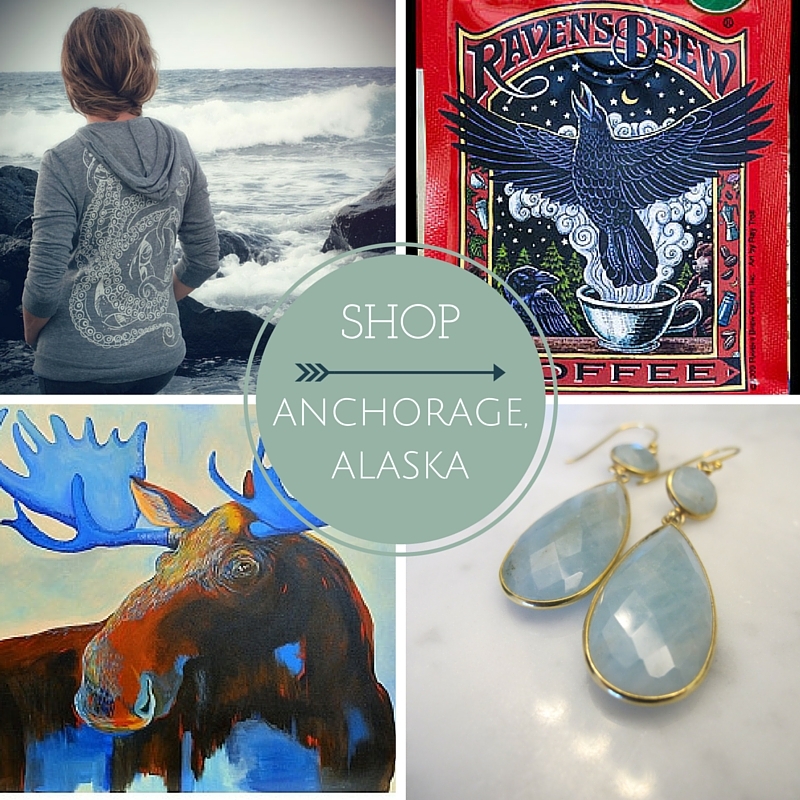 They also have a collection of other Alaskan-made items like jewelry and soaps. Their soft hoodies are perfect for the cooler Alaska weather. This large gallery features the whimsical art of Katie Sevigny and other Alaskan artists. It also offers artistic tees and sweatshirts, pottery, and jewelry. We think Katie’s prints are happiness on paper and a great way to remember your northern adventure. A few blocks away from tourist-heavy Fourth Avenue is this home decor and jewelry shop. It has a fun collection of vintage home items, but its real draw is the large collection of jewelry. There are so many beautiful gemstone necklaces and earrings that it will take you an hour to narrow it down and pick which one to buy. Let us first say that this place is very busy and popular. Be prepared to wait, often for an hour or more, or make reservations the day before. If you decide to wait, you can get a cup of coffee or pastry from their to-go counter to tide you over. Three favorites: stuffed French toast, the Neuvo Heuvos, and the Kodiak benedict. Make reservations at this popular spot for local fish and grilled meat. We recommend any of the Alaskan fish and the ribs (be sure you like spicy). A little bit away from downtown is this upscale diner-type restaurant with one of the best burgers Laura’s ever had (the one with bacon jam). The weekend brunch is a less-busy option to Snow City Café, and they offer lunch and dinner during the week. We also love the Cobb salad and their craft cocktails. This is quite possibly the most popular restaurant in Anchorage, so be prepared to wait or order carryout. The large menu is full of gourmet pizzas and some of the best locally brewed beer you’ll find up there. Our favorite pies are the Brewhouse Favorite and the Backpacker, which is delicious washed down with a Northern Lights Amber. A newcomer to the Anchorage dining scene is the Rustic Goat, featuring modern comfort food. The two-story building was built with lumber from an old fish cannery, giving the new building a rustic, weathered feel. The kale salad was out-of-this world and was followed by an equally delicious salmon dinner and s’mores dessert. Figuring out what to do in Alaska is easy: anything that is outdoors. The most popular in-town hike is Flattop Mountain, which will give you a great view of the city and Mt. McKinley on a clear day. 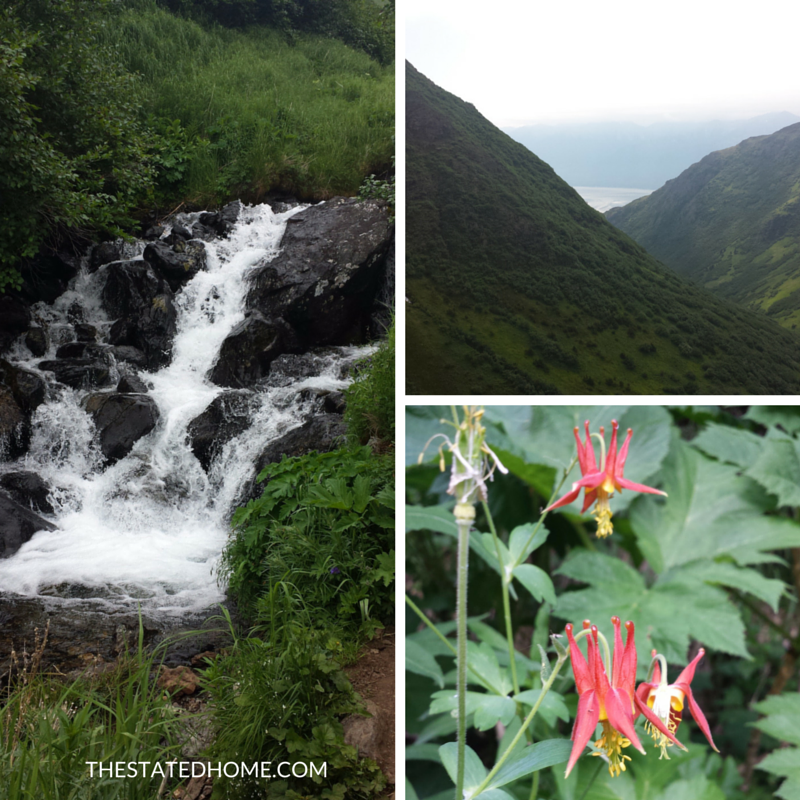 As soon as you head south out of Anchorage, there are a plethora of less busy hiking trails. For a challenging route that takes you alongside a fast-flowing creek, we suggest the Falls Creek trail (that’s what all of these photos are from) around mile marker 105. Make sure you’re prepared with good shoes, water, snacks, bear spray (seriously), and possibly a walking stick. For an up-close look at Alaskan sea-life, drive about two hours south of Anchorage to the cute town of Seward and hop on a glacier cruise where you may run into whales, otters, and porpoises.